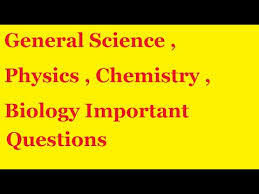 Physics related questions and answers Part 4 And Physics questions and quizzes, quiz on Physics, important Physics, important Physics and questions, general knowledge questions and answers related to general science And physics general knowledge objective questions answers are important in like RAS, IAS, UPSC, RPSC, 1st, 2nd, 3rd Grade Teacher, REET CTET, LDC, SSC CGL, IBPS, MBA, CAT, MAT, SBI-PO, RBI And Railway, Indian Army And all competitive Exams. Question (1) What is resistance? Question (2) What is the device to generate the electric current? विद्युत धारा उतपन्न करने की युक्ति को कहते हैं? Question (3) Which is the person with near-sight defects involved in the glasses? निकट दृष्टि दोष वाला व्यक्ति के चश्में में लगा होता है? Question (4) Which is a person with a long sight defect in the glasses? दीर्घ दृष्टि दोष वाला व्यक्ति के चश्में में लगा होता है? Question (5) How does the pupil come in bright light? तेज प्रकाश में पुतली का आकर कैसे हो जाता है? Question (6) How does the pupil come in bright light? Question (7) What Is people with far-sighted eyes clearly see? दूर-दृष्टि दोष वाली आँखे साफ-साफ देख सकती हैं? Question (8) What point in the human eye does not remain absolutely sensible for the light, is it called? मानव-नेत्र में जो बिंदु प्रकाश के लिए बिल्कुल सुग्राही नहीं रहता होता, उसे कहते हैं? Question (9) What is it in the human eye? Question (10) Does the sun appear when it rises and falls? उदय और अस्त होते समय सूर्य दिखाइ देता है?